Color is magnificent you can't go wrong on color or price! Beautiful and worth every penny! Blessed! Liven up your living space with this lovely rug. This rug will enhance and complement any room in your home. The rug is very comfortable and will add style and sophistication to your abode. 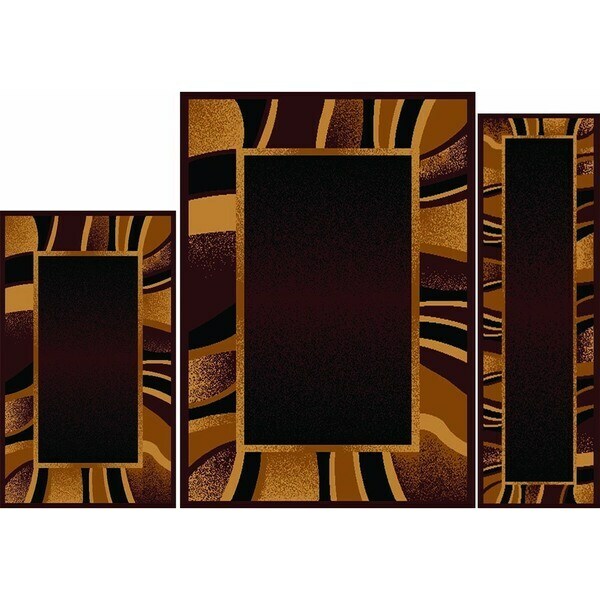 I absolutely love this three piece rug set. The quality is good and it's very stylish. It would add a beautiful touch to any room. The colors are awesome! I can not say enough to express how happy I am with the blend of texture and colors. We are so happy with our overstock purchase! Everyone gives compliments about this rug set. We love it! The design is nice but the rugs are very thin and dont lay as i would have liked. The price is very cheap but would rather pay more and get a better looking rug. Nice good rim colors were adds a splash of class to my kitchen while on a budget. I would have given no stars for this item if I was able. The rugs are extremely thin. The wrinkles never started to get better. Very frustrating. This was not at all what I was expecting. Sometimes you get what you pay for. Beware. Very thin and extremely slippery, even with non skid pads I had to tape it down because such a slip hazard. Everything sticks to it and does not hold up to washing well. Sure the picture provides and amazing design. Less pronounced once you see them up close. The thickness is very thin and can tend to curl on the ends, trip hazards. The price is low and delivery was fast. Hoped for a nicer look - the design has a faded look in person. For a guy's home the rug it looked manly. It had a great review! Home Dynamix Premium Collection Contemporary Brown Area Rug - 5'2" x 7'4"